As a tea drinker, and I am sure this is true for you, I adore teaware, from bombillas to matcha whisks. Everyone has their favorites. 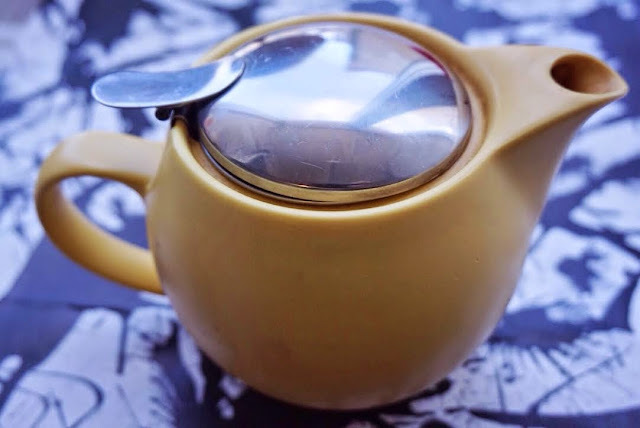 This series showcases the favorite teaware of folks in the tea blogging community. Today's faves are from Sara Shacket of Tea Happiness. 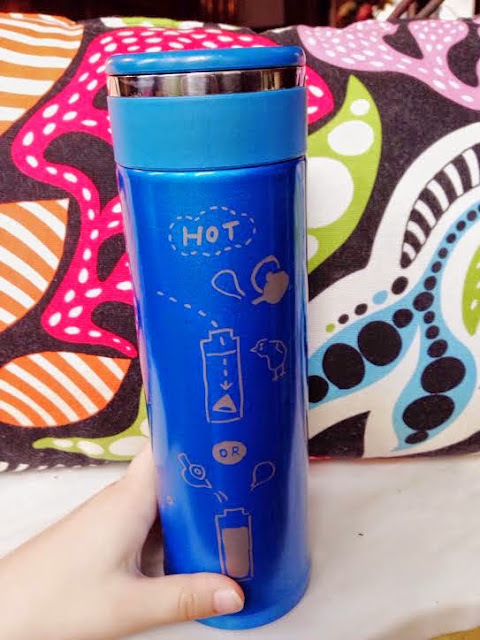 My Zojirushi tea tumbler is an essential part of my tea routine. I will often brew a pot of tea first thing in the morning, and take the remains with me for my subway commute. It makes the train ride so much better. I barely notice the crush of people or loud noises around me when I have good tea to sip. I use the tumbler on the weekends as well, when we need to leave the house early. The Littest Tea Critic also likes to steal sips from it, as you can see from her little hand in the picture! Another teaware essential I cannot live without is my little beehouse teapot. It's the perfect size for a mug and a half of tea in the office. I use it multiple times during my workday to brew strong black teas to get me through long meetings. It is a familiar sight around my office. My travel gaiwan and tea tray are also essential for office tea enjoyment. I use this daily for more delicate and special teas. It gives me a reason to slow down and have a mini tea meditation in the middle of a hectic work day. I have a weakness for collecting things, and I love vintage tea cups. Drinking tea from a dainty cup makes every sip special. I also like the idea of a more formal tea time. I've been collecting vintage cups for many years, and art deco style cups are my favorite. They also make lovely display pieces. My final favorite isn't actually something I use. It's an old beat up sugar canister my grandparents had on their table during my childhood. They drank tea with sugar cubes nestled between back teeth for a sweet sip every time. 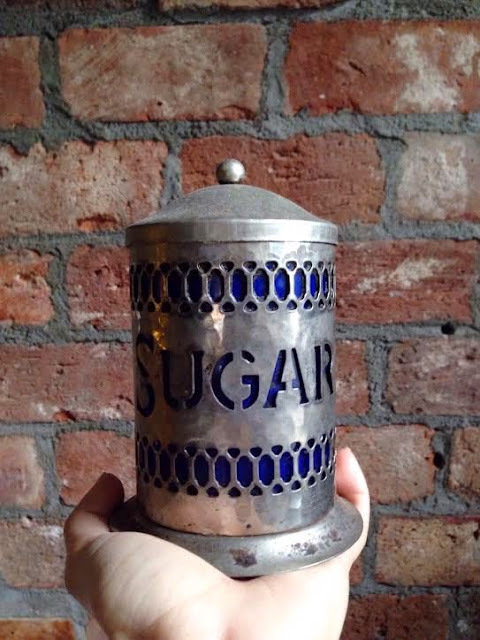 I would steal sugar cubes when no one was looking for a crunchy, sweet secret. I am flooded with happy memories of spending time with my grandparents every time I look at it. Two of my favorite things about Sara's blog are the industry interviews and the Littlest Tea Critic tastings. I appreciate your sharing of your favorite teaware and their stories with us, Sara! All photos and stories courtesy of Sara Shacket. Thank you for giving me the opportunity to share with your readers, Georgia! Sara, thank you! 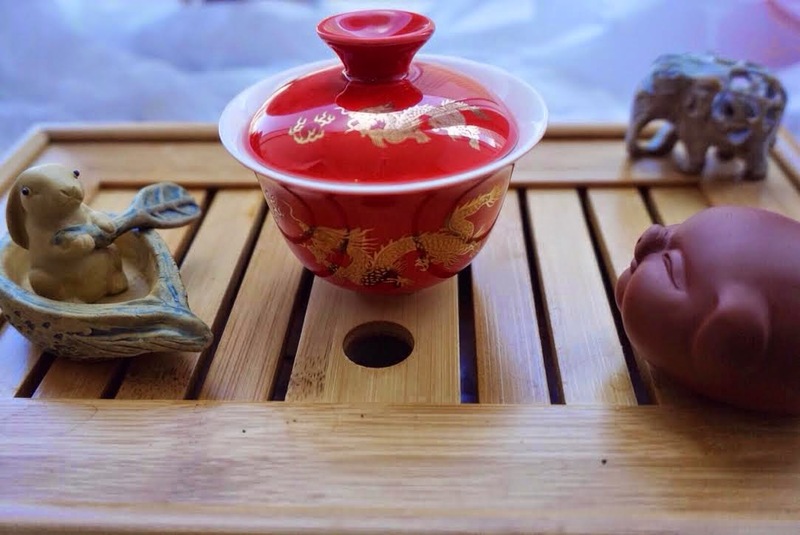 I really enjoy reading everyone's stories and seeing the photographs of their favorite tea ware.